Being rich would bring a whole new set of life problems that those of us that are not rich would like to try and solve. If you are loaded and collect expensive watches, you might want to protect them and keep them wound up without having to slum it and wind the things yourself. 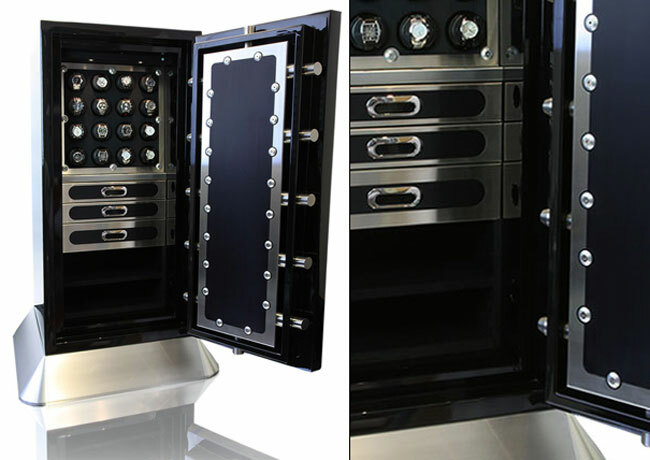 The perfect thing would be the new Chronos Safe from Brown Safe Manufacturing. The thing has several ways the insides can be configured including one with a sweet rotating watch gallery and self-winding mechanisms. The safe also has a very robust security system. The safe uses fingerprint biometric sensors, GPS anti-theft system that interacts with a home automation system and more. The outside of the safe if covered with military-grade ballistic armor too. I don’t even want to know what this would cost.